Aubrey Dan, left, president of Dancap Productions, surprises Amanda Sant, 21, from Innisfil, Ont., with the news she will go to New York to see Jersey Boys on Broadway. Sant was the millionth customer at the Toronto production of Jersey Boys on Wednesday, July 23, 2010. The Innisfil woman was surprised Wednesday afternoon to be told she was the millionth customer to attend Jersey Boys, the hit musical presented by Dancap Productions at the Toronto Centre for the Arts. 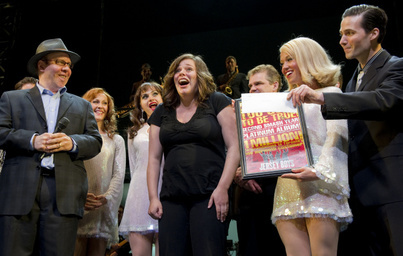 Sant, who is five months pregnant, took her mother to the matinee and was rewarded with a prize of an all-expense-paid trip to New York, including a night at Jersey Boys on Broadway, where the show opened in 2005. For almost two years, the musical saga of Frankie Valli and the Four Seasons has played to large and enthusiastic audiences in Toronto, just as it has done in other cities across North America since its first tryout in La Jolla, Calif., in 2004. Dan said the success of Jersey Boys has also given him courage to continue in his battle to be considered as a major presenter of commercial theatre in Toronto. He has struggled to get venues and some of his attempts have failed, such as last fall’s show The Toxic Avenger. Dan is one of the producers of Memphis, which won this season’s Tony Award for Best Musical, evidence that the quirky, slouch-hatted impresario is not to be written off as a major player on the city’s scene. As for the lucky Sant, her prize trip will be her first ever to Manhattan, and a memory she’ll never forget.